We welcome donations to support and promote Manx cultural heritage. If you have benefitted from our work and feel able to make a donation, no matter how big or small, then we would be delighted! You may have come to some free Manx language classes, music workshops or performances, taken part in Bree trad youth movement, enjoyed our short films or our rich and varied online archives - if you'd like to invest in more of the same, then your help is most welcome. If you would like to talk to us about making a donation or leaving a legacy linked to a particular aspect of our work, please contact the Director on email or by phone: 01624 676169. Our work isn't possible without your support! 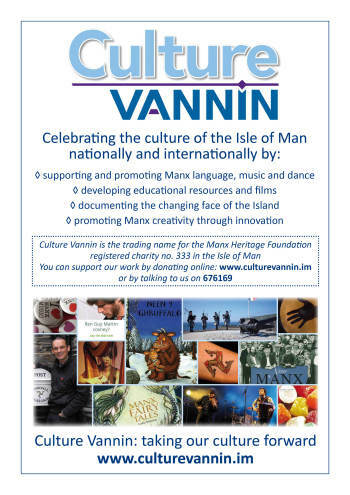 Culture Vannin is the trading name for the Manx Heritage Foundation, registered charity 333 in the Isle of Man.